Jurgen v/d Goorbergh Honda NSR 500 2002 1/12th scale model by Minichamps / Paul's Model Art. This model is from the most gorgeous highly detailed range of replica bikes ever made. 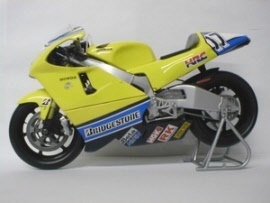 This particulair model is Jurgen's 2002 Team Kanemoto Racing Honda NRS500 and features working steering an suspension and fairing panels that reveal intricat details of the engine. It is built in the scale of 1:12 which results in a model of some 15 cm, or 6 inches, in length.